How Efficient Is Your Sprinkler? What's better: water your lawn for 20 minutes, or water your lawn for four minutes, five times a day? If you think it doesn't make a difference, think again. State water conservation experts say the clay soil predominant in the Bay Area can't absorb water as fast as some sprinklers put it out—and that's your opportunity to save water and money. Landscaping makes up half the water bill for most homeowners, according to researchers at University of California, Davis. And it’s often the most wasteful piece of the water picture. 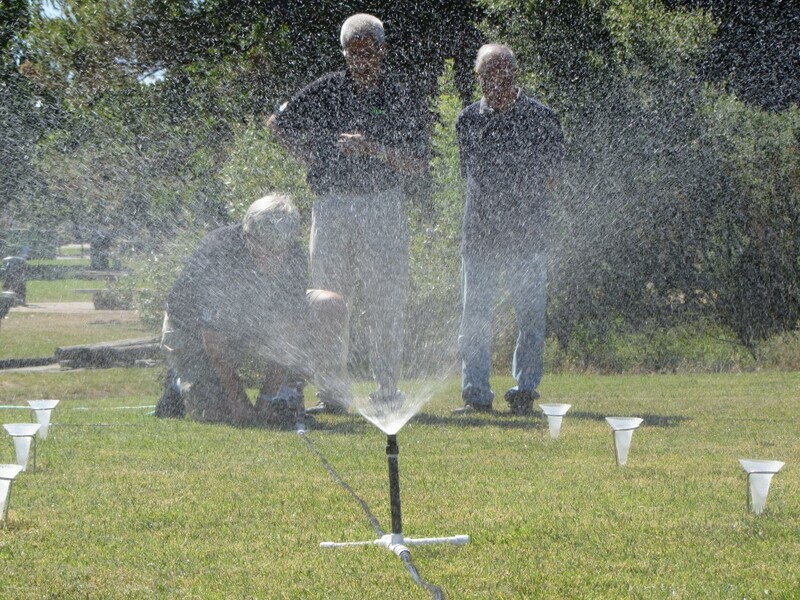 At a recent state-sponsored workshop on how to conserve water in yards and gardens, trainer Jim Borneman handed around a high aerial photo showing a lawn that was being watered for so long, water was pouring out across the street. “If we can see your runoff from a space shuttle, it’s a problem,” Borneman said. Most landscapes are over-watered by about 50 percent, according to water conservationist Scott Sommerfeld with the East Bay Municipal Utility District, and some are over-watered by as much as 400 percent. Sommerfeld, who spoke at the workshop about how to interpret your water bill, said most customers he talks to don’t really know how much water they’re using, even though EBMUD prints a “water budget” on bills for irrigation customers. The Department of Water Resources and UC Davis Center for Urban Horticulture are holding trainings across the state for landscapers and homeowners to make their watering systems more efficient. The workshops are held in English and Spanish. 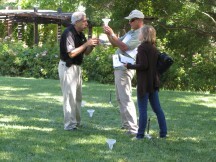 Landscapers for government, commercial and private properties attended a recent workshop in Walnut Creek. Residential landscape designer Robert Dye came to learn how to maintain his clients’ yards in Contra Costa County, where the water district has requested a that customers voluntarily reduce water use by 15 percent. “Everybody’s trying to keep their yards alive and survive this mess,” he said. Trainer Jim Borneman, who works with Ewing Irrigation and Landscape Products, led a sold-out session for about 100 landscapers, demonstrating how to measure the precipitation rate of a sprinkler system and check to be sure it's watering evenly. He said landscapers want to learn how to conserve water, because their livelihoods depend upon it. Borneman emphasized that spray-head sprinklers should never run for more than four minutes at a time, because clay soil can only absorb so much water. Handing around photos of sprinklers irrigating lawns and showing the excess water pooling on the sidewalk, Borneman said sprinklers should run on several timed cycles throughout the day, in order to avoid runoff. “Matching application rates to soil intake rates—that’s what we have to do,” he told the audience. Despite the minimal equipment needed to ensure your lawn is watered evenly, forty to fifty percent of sprinkler systems have never been checked for water pressure and spacing of the sprinklers, Borneman said. UC Davis' landscaping resources page offers tips for everyone from home gardeners to professionals.